Anyone seeking proof that all it takes for a radical to become part of the establishment is a little bit of endurance need only look to “Skin Flicks,” TIFF Cinematheque’s retrospective of the films of Toronto zine impresario, radical, occasional pornographer, and queercore filmmaker Bruce LaBruce. A farm boy who left his rural digs for a more urban life in Toronto in the mid-‘80s, LaBruce first turned heads on the scene with his publication (along with partner and Fifth Column frontwoman G.B. Jones) of the seminal queer punk zine J.D.s, which distinguished itself from punk culture through its queer vision, and from mainstream LGBT culture through its aggressive DIY aesthetic and radical politics. From that fertile underground world came the first of LaBruce’s experimental Super 8 shorts, including Boy, Girl—ground zero for later thematic obsessions such as neo-skinheads and surveillance. 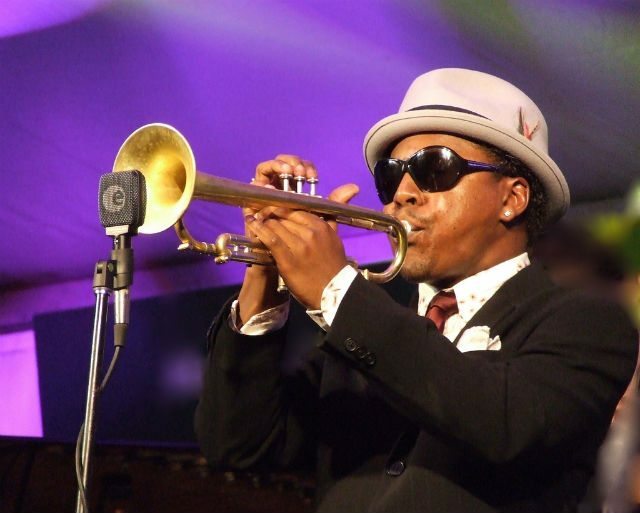 Roy Hargrove in Toronto, 2007. Photo by Tracey Nolan. On June 19, the Toronto Jazz Festival will once again descend upon Nathan Phillips Square and clubs and concert halls all over the city. Friday night will feature a free concert at Nathan Phillips Square, presented in partnership with WorldPride, with sets by Melissa Etheridge and Deborah Cox. There will also be a huge fireworks display and the raising of the rainbow flag—it’s bound to be a real party. There are lots of big names at the fest this year, including Chaka Kahn, Bobby McFerrin, and Earth, Wind & Fire. Here’s our rundown of some of the other shows worth checking out. Forget raising the roof, it’s time to get rid of it altogether! Why? Well, for lack of a better name, it’s the opening night of the Open Roof Festival. Returning for its fifth season, this weekly series pairs performances from local musicians with film screenings under the stars. Let Hamilton’s Thought Beneath Film lull you into a false sense of security with their catchy pop-rock, before things get psychologically thrilling with Enemy. Fans of oddball British humour—rejoice! The Lower Ossington Theatre has brought the genius of Monty Python’s Eric Idle to Toronto with their rendition of Spamalot. Watch as flying cows, killer rabbits, and all sorts of bizarre elements come together to tell a twisted version of the legendary story of King Arthur and the Knights of the Round Table. Rue Morgue is offering up some pretty, uh, stiff competition for your typical Netflix-on-the-couch Thursday night with their June CineMacabre screening. Rigor Mortis sees a washed-up actor move into a new apartment with the intent to end his life, only to become distracted by his strange neighbours and the eerie occurrences that take place in their building. Produced by Takashi Shimizu, creator of The Grudge, the film combines ghostly imagery, Chinese superstition, and vampirism to make one gorgeous and chilling horror piece. Come for the scares, stay for the deliciously gruesome snacks, alcoholic drinks, and prizes from a variety of spooky sponsors! 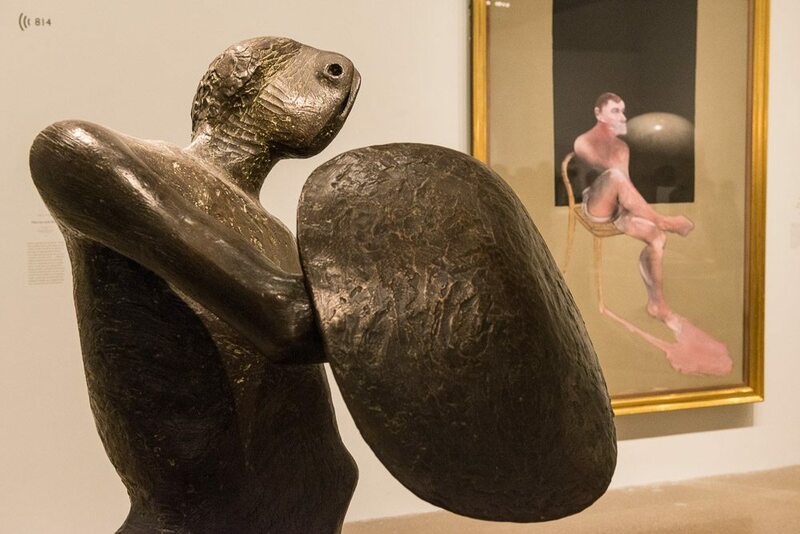 These quotations, which welcome visitors to “Francis Bacon and Henry Moore: Terror and Beauty,” immediately establish the exhibition’s tone and focus. Each artist’s distortions of the human figure, shaped by their wartime experiences, capture the vulnerability of our mortal forms. 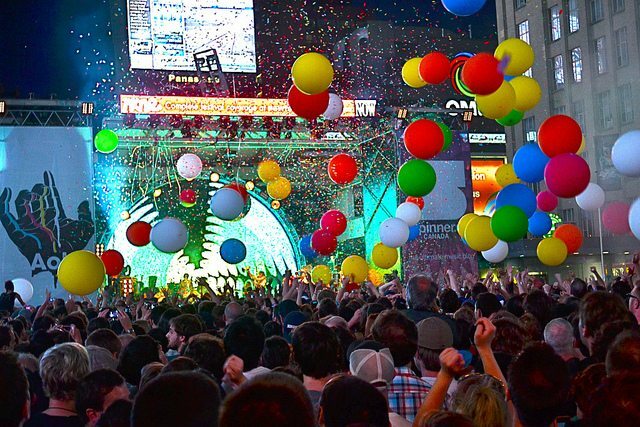 The Flaming Lips play Yonge-Dundas Square at NXNE 2012. Photo by Cameron McLellan from the Torontoist Flickr pool. Returning for its 20th year, NXNE is celebrating the milestone by offering audiences another vast selection of events to sift through and enjoy over the course of nine days. While music may still be its focal point, the festival has developed over the years into a mirror image of SXSW—a multidisciplinary arts extravaganza that people look forward to all through the winter as if it were a light at the end of a dark and dreary tunnel. After enduring an especially long and brutal stretch of cold weather this year, it will feel especially rewarding to slap on a wristband and squeeze every ounce of pleasure out of the 2014 lineup. Every part of our city will be drenched in WorldPride this summer, including the TIFF Bell Lightbox. Bent Lens: Pride on Screen comprises nearly two months of screenings, exhibits, and speaking engagements that reflect the broadness of our LGBT community. Check out films under the stars in David Pecaut Square, take in a conversation with Laverne Cox of Orange is the New Black, and much more. CORRECTION: June 16, 2014, 3:50 PM This post originally stated that the outdoor screenings of Bent Lens will focus on Derek Jarman and Bruce LaBruce, but that is not the case. 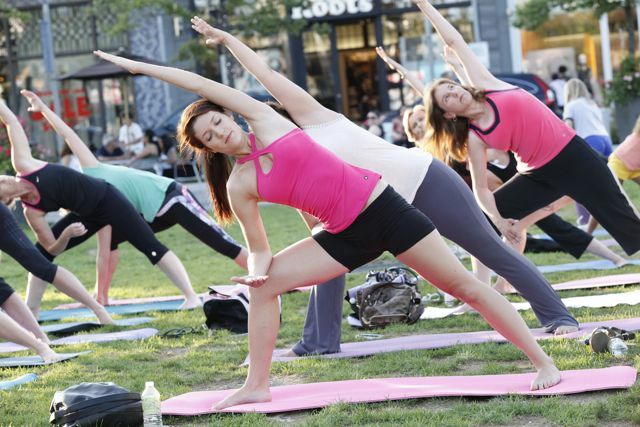 Shop till you drop, then stretch it out with a free yoga class in the Town Square. 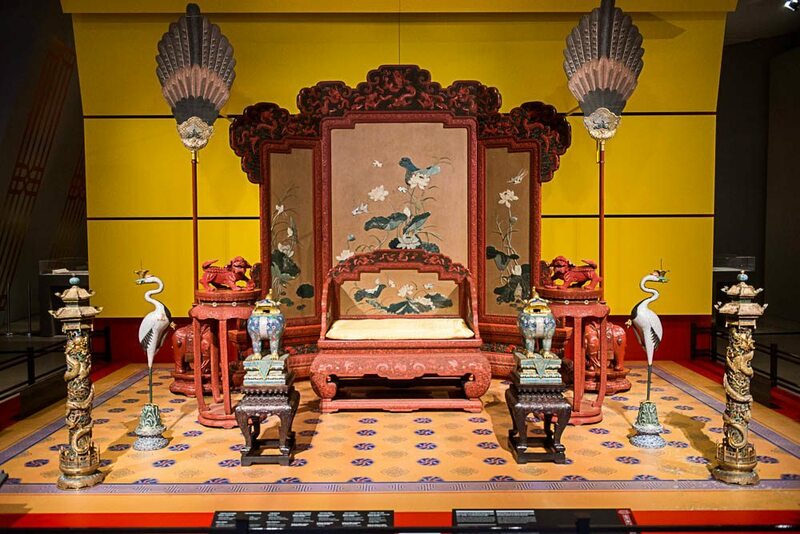 Photo courtesy of the Shops at Don Mills. Align your body, ease your mind, and get your retail therapy all in one stop this summer at the Shops at Don Mills. Bring your mat for free Yoga in the Town Square every Tuesday and Thursday, courtesy of Titika. 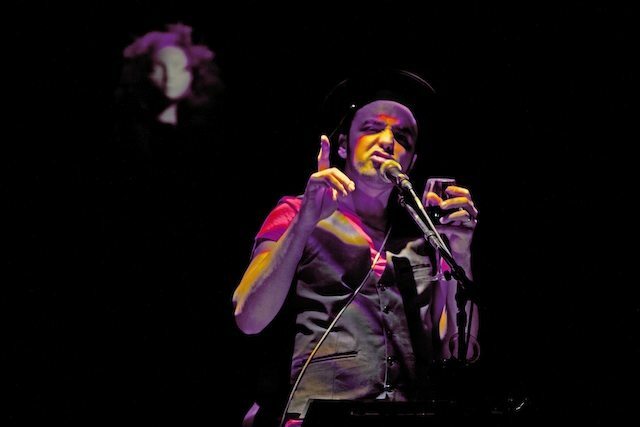 Hawksley Workman in The God That Comes. Photo by Trudie Lee. First things first: the Tarragon Theatre mainspace is now licensed. That means that during its current production, The God That Comes, starring Hawksley Workman—which has set up the space like a dark, sultry 1930s cabaret with crystal chandeliers, long white tablecloths, and deep crimson curtains—you can sip a glass of red while one of Canada’s best rockers uses his beautiful voice to scream into your face. If you haven’t heard of Twelve Angry Men, you’ve likely seen it parodied in a number of movies and television shows over the years. Now here’s your chance to see the real deal, on stage, thanks to the Soulpepper Theatre Company. Watch the drama unfold in a claustrophobic deliberation room as one dissenting juror unravels what is supposed to be an open-and-shut murder case. 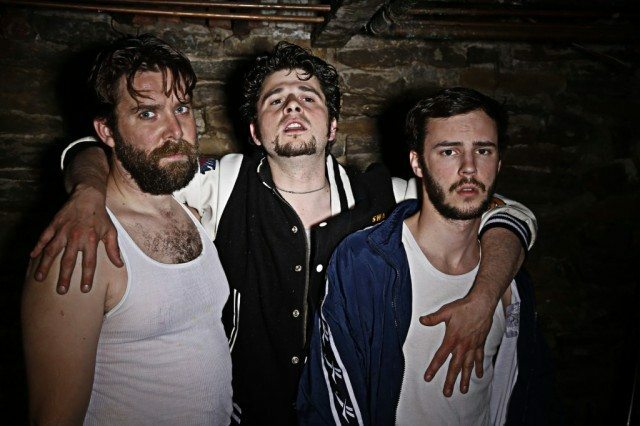 Brehnan McKibbon, Bejamin Blais, and Jakob Ehman are the Chiavetti Brothers in Cockfight. Photo by Zaiden. The latest work by prolific playwright Kat Sandler, who generates clever content for indie-company-on-the-rise Theatre Brouhaha, Cockfight follows an unlikely attempt by three foster brothers to obtain a rooster in order to make their fortune in underground cockfighting matches. Sandler—named one of our “local ladies who make us laugh” in 2013—has often applied her gift for comic dialogue to tragic stories, and in her latest play, the characters are more desperate and downtrodden than ever. This time around, Sandler is also directing, and she has a deft touch for showing off her protagonists’ dramatic strengths—though her supporting character and the lead-up to the brothers’ climactic confrontations are not as well developed.